It’s beginning to look a lot like Christmas at least in Poland! I finally put together a post about some of my favorite Polish Christmas decorations and gift ideas, particularly handmade ones. Even if you don’t live in Warsaw, I have provided several online store recommendations as well. So now you bring a little bit of Poland into your home like we have! 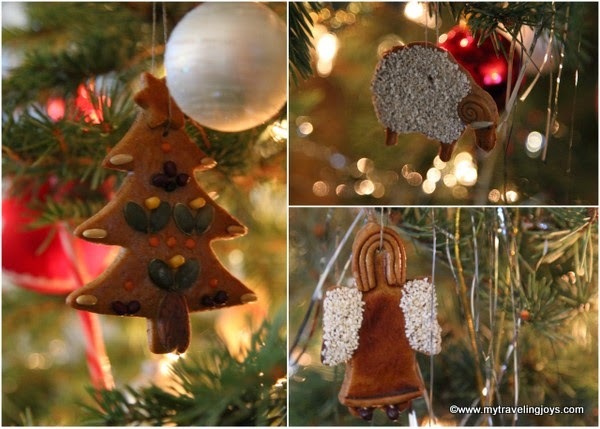 One of the most popular Polish decorations is made from gingerbread (pierniki). You’ll find gingerbread hearts, snowmen, angels, trees, trains, snowflakes and more at the slightly-hidden Tebe shop located along busy Aleja Jerozolimskie. You can even buy edible gingerbread spoons that you can dip into your morning cup of coffee or tea. Whenever I’ve popped into Tebe, the couple who run the shop are quite friendly and help me find the ornament I want. They use only natural ingredients to make the pierniki dough, which is baked and then decorated with dozens of different types of seeds, dried flowers and fruits. For example, red lentils outline the stars and poppyseeds make up the snowmen’s hat. 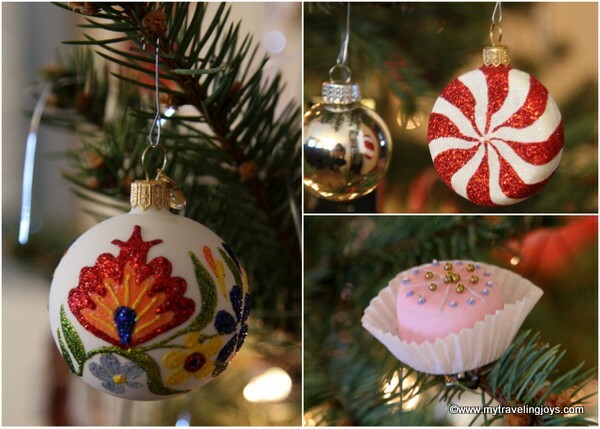 Another popular item that most Americans will recognize are colorful, blown-glass ornaments, known as bombki. Following WWII, bombki appeared on the market again and became a major export for Poland. In the U.S., you’ll find these traditional ornaments at large department stores such as Dillards and Macy’s, but they will cost you about 5 times or more than what I’ve paid here in Poland. I bought my bombki from Bombkarnia, across the street from the Palace of Culture, which is open year-round and also sells pretty Easter egg ornaments in the spring. Note to European and American readers, Bombkarnia does have an online store and ships all over the world, so you can have your own Polish glass ornaments at home! Even if you've never been to Poland, I'm sure you've seen or heard about Polish pottery. You’ll find the ever popular Polish pottery being used in all kinds of Christmas décor from serving plates to cake stands as well as Christmas ornaments and candle holders. I love visiting the friendly, English-speaking Anna at Anka Pottery in Mokotow. Anna will happily ship to the U.S. and will fulfill orders for particular patterns too. I can also recommend buying pottery from the Cepelia stores and Bolesławiec Pottery, which is near the Rondo Onz tram stop. Additionally, if you live in the U.S., you can contact my friend, Donna, who used to live in Warsaw and now owns a Polish pottery business in Texas. You can order from her online store at Touch of Poland. Wherever we have lived, I love learning how to cook the local dishes. Below, you'll find a few of my favorite Polish cookbooks, which you can directly order from Amazon.com. Applebaum's book is one of my favorites because the Polish recipes are practical and adapted to more modern tastes. Both Rose Petal Jam and Sugared Orange are not only filled with beautiful, seasonal photos from around Poland, but also delicious recipes. A great gift for the cook in your family! In Poland, you'll find a variety of handmade jewellery, with Baltic amber stones being the most popular. I also like the handcrafted ceramic and wooden beaded necklaces that you'll often find at local Christmas markets. My niece is into writing in journals, so I bought her several cool Polish-looking notebooks from Empik bookstores and Bęc Zmiana Foundation in Warsaw. When all else fails, give your loved ones popular Polish food and beverages. You can't go wrong with gifting Polish vodka or kabanos, at least not with most of my friends and family members! And you can even buy these items at the airport! Which Polish gift would you like to receive for Christmas? Awesome post as always. I still have my gingerbread ornaments you sent me last year. Merry Christmas everyone in advance.And thanks for this lovely blog. Hope so that this will help me in my next trip out there. I m now planning a trip to Spain with the help of a detailed Spain Road Map. Hope so that I m going to get help from this. Wow!!! I like the idea of polish jewellery as a gift. I would definitely get it for my friend on this Christmas. She would love it!!! I created my own Christmas gifts top http://www.christmasgiftstop.com/best-christmas-gifts-for-a-boyfriend/ visit it and I'm sure you'll find the best gift for your second half easily. Try to and good luck.